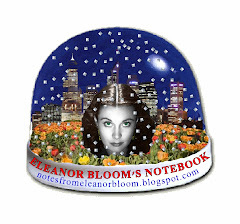 notes from eleanor bloom: Why the hate? It has puzzled me why so many hate Gillard on a personal level and with such a passion. Gillard is arrogant. And stuck up. My prisoner, I mean, interviewee, explained that Gillard speaks in the manner of: All of you, now listen to me for I am the PM! Like she's lording it over everyone. 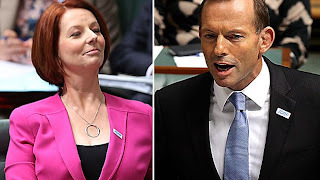 …Gillard is not a leader. She doesn't have that quality (or perhaps, experience, my interviewee allowed) that inclines people to want to follow her. Finally, the one that summed it all up for me: the PM is weak. The insults actually insult her. She shows hurt. And, like a pack of wolves, once weakness is sensed they go in for the kill and don't stop until the prey is annihilated. 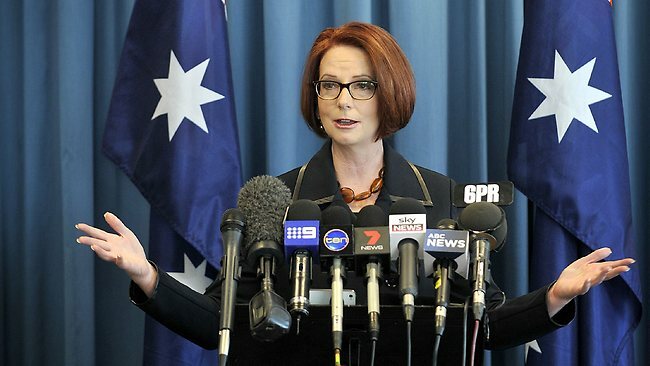 For me, I didn't think Gillard was showing a lot of weakness. 'She is standing up to them!' said I. But no, for the act of JG merely bringing up these things, and in the manner she does, is the equivalent of her saying 'Stop hurting me! Stop it!'. Oh, I said. Could it be you are judging her this way because she is female? But no, Thatcher showed strength. And, returning to the leadership qualities, many women have those. Oh good, I said. So, what do you think? Is this what you are hearing from people? We know Gillard is good at getting people together and nutting things out until an agreement is reached (unlike Rudd who was too busy fretting about it alone in a room while his underlings ran around at all hours frantically preparing reports for him not to read before he did not make a decision). But is she someone people want to follow? And listen to? I think we know the answer to the latter question. No one is listening. Kevin 24/7 they listened to... until the vertiginous act of endless eye rolling had them tuning off post all those 'gotta zip' and 'fair shake of the the sauce bottle' comments 'folks'. I would rather someone achieved ...than prattled and was listened to. But both would be rather fine in a leader.